Chocolate is delicious: I’ll get no argument there. But though we all love the stuff, its reputation hasn’t always intersected with, “It’s good for you." The changing trends of “chocolate as good for you" are an apt example of how often our perceptions of “healthy food" change. Scientists have spent thousands of years decreeing what food is good for us. Unfortunately, nutritionists have never been consistent. Remember how wine was good for us, then bad for us, then good for us again? Yeah, me too. I got into health food in the 1980s, back when people regularly laughed at the notion of us hippies rejecting convenience food. Even then I understood why they felt that way. “Health food" often meant dinners with unappealing names like “carrot-nut loaf" or “soy-bean patties," which had the density and tastiness of your average brick. One of the first health food cookbooks I bought added three tablespoons of brewer’s yeast to everything, “because it’s good for you," without supporting evidence. Too many of the tenets of healthy eating were superstition rather than scientific data. Among the ingredients cast aside “for health reasons" was chocolate. In the introduction to my copy of Rodale’s Naturally Delicious Desserts and Snacks, published in 1978, author Fay Martin wrote, “…Who wouldn’t prefer to avoid the empty calories of white flour with all its bleaches and preservatives? And why risk the allergy problems so many chocolate eaters encounter?" Yet the same cookbook unapologetically included ten recipes using peanuts as a primary ingredient – a far more common allergen. Instead of chocolate, back then we health foodies substituted carob in everything from brownies to frozen-yogurt shakes. That was dreadfully unfair to carob. It wasn’t chocolate and never would be. It could taste fine, but you had to appreciate it for itself rather than pretend it was chocolate. Nobody disputed the appeal of chocolate. Totally aside from its inherent tasty wonderfulness, chocolate makes us feel good. “Chocolate contains theobromine, caffeine, phenylethamine (PEA), and anadamide that add to its appeal. These chemical substances have a profound effect on the brain and demonstrated that chocolate has a definite physiological effect on the body," wrote Carole Bloom in All About Chocolate, back in 1998. This made me wonder: What made anyone think that chocolate was such a bad idea? Americans consume 2.8 billion pounds of chocolate each year, or over 11 pounds per person, so this is not a trivial item to take out of our cupboards. Certainly, you’ll pry my chocolate out of my cold, dead fingers. I went through my collection of 80s cookbooks, several of which explained how to use carob as a substitute, and none of which explained why you should do so. By the late 80s I began to see chocolate used in health food recipes again (with natural sweeteners such as honey and maple syrup), so either everyone forgot that chocolate was supposed to be bad for us, or we admitted we liked chocolate and we going to eat it anyway. Maybe both. Certainly, chocolate started out with lots of therapeutic promise, going back to its origins in Mexico. The Badianus Manuscript (dated to 1552) includes paintings of medicinal plants and describes Mexican disease concepts and treatments. That manuscript makes it clear that cocoa derivatives were used as nutrients or remedies for angina, constipation, tartar-related dental problems, dysentery, dyspepsia, indigestion, fatigue, gout, and hemorrhoids. The Accademia de Lincei edition of Hernandez’s Mexican Treasury, published in 1651, reported the different prescriptions followed by natives: “Without adding any other ingredients, chocolate was used for liver disorders; four grains of cocoa and a dose of gum (holli) toasted and mixed together ‘restrained dysentery;’ the drug called atextli was made using a fine paste of cocoa and corn, to which mecaxochitl (Piper sanctum) and tlilxochitl (Vanilla planifolia) could be added, as an aphrodisiac. The frequent use of a beverage made with grains of pochotl and cacahoatl, instead, was extremely fattening and was therefore recommended to slim and asthenic people." In general, from the 17th through to the 19th centuries, the presumed merits and medicinal properties of cacao and chocolate could be divided into three main groups: to enable patients to gain weight, to stimulate nervous systems, and to improve digestion. It wasn’t until the 18th century in Florence that chocolate began to get a bad rap. personages: Doctor Giovan Battista Felici accused chocolate of causing heart palpitations, intermittent pulse, convulsive movements, and apoplexy. At the other side of the kerfuffle was Carl von Linné (Linnaeus), who identified three kinds of illnesses in which chocolate could be used appropriately: loss of weight, as a consequence of lung and muscles diseases, hypochondria, and hemorrhoids. He added also that it was an excellent aphrodisiac, an opinion held since Pre-Columbian culture. None of which stopped anyone from eating chocolate because… well, you don’t need a reason, do you? Still I did find some of the “evidence" of chocolate being bad for you. As a Bon Appetit article pointed out, “In 1988 alone, chocolate was scientifically accused of causing itching, causing migraines, and causing indigestion." (So much for chocolate being good for digestive issues, huh?) And by 1993 scientists found that a chemical found in chocolate might give you kidney stones. There’s some merit in these concerns, of course, and some poor souls truly are allergic to chocolate. The Mayo Clinic warns that “Chocolate may cause acne, allergic skin reactions, bloating, colic in infants, constipation, decreased bone density, dental caries, eczema, gas, headaches, improved insulin sensitivity, increased cholesterol levels, increased insulin levels, irregular heart rhythms, increased oxalate levels in urine, irritable bowel syndrome, irritability, jitteriness, kidney damage and disorders, migraines, nausea, neck pain, nervousness, shakiness, sleep disturbances, stomach rumbling, stomach upset, swelling under the skin, unpleasant taste, upset stomach, vomiting, [and] weight gain." The biggest problem with chocolate is not the cocoa but the unhealthy ingredients you consume along with it, primarily sugar and artificial sweeteners. And if you’re the sort of person to count calories, you’ll be dismayed to learn that a 100g chocolate bar contains: milk chocolate 520 kcals, dark chocolate 510 kcals, and white chocolate 529 kcals. Which has an easy answer: Don’t use the other ingredients. For example, among cocoa’s beneficial attributes are a positive effect cholesterol levels because it consists mainly of stearic acid and oleic acid, which do not raise blood cholesterol levels and all its concomitant dangers. However, milk binds to antioxidants in chocolate making them unavailable; therefore, milk chocolate is not a good antioxidant source. Because there’s growing evidence that chocolate, itself, is good for us! •	High levels of chocolate consumption might be associated with a one third reduction in the risk of developing heart disease, reported a study from August 2011, presented at the European Society of Cardiology Congress in Paris. 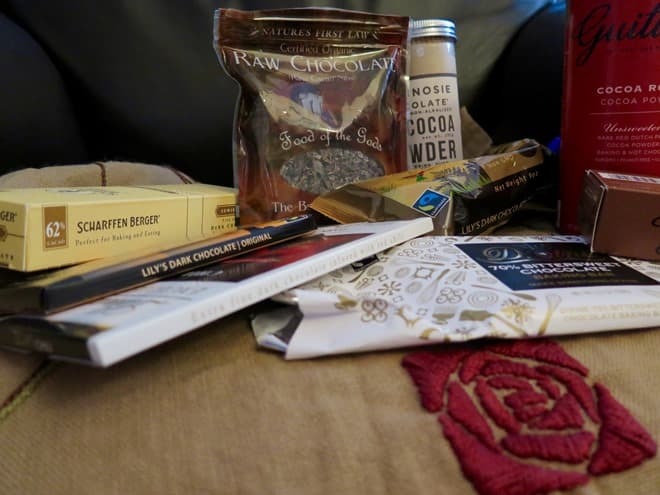 “The findings confirmed results of existing studies that generally agree on a potential beneficial link between chocolate consumption and heart health. However, the authors stress that further studies are now needed to test whether chocolate actually causes this reduction or if it can be explained by some other unmeasured (confounding) factor," said a press release. •	Eating up to 100 g of chocolate daily was linked to lowered heart disease and stroke risk in June 2015. Dark chocolate, with 70% cocoa solids, is the healthiest, since it has little sugar, its fat comes from cocoa butter, and it contains iron and magnesium. •	In February 2016, the Society for Maternal-Fetal Medicine heard the findings from a study indicating that chocolate could have a positive impact on placenta and fetal growth and development. In other words: The more chocolate, the better. However, even chocoholics like myself must add a degree of cynicism to such research. That’s what this article at the Guardian did, for instance. The point I want to make is not that chocolate is yummy (you know that) or even that it’s good for us. It’s to suggest that you consider the assumptions of those who say that a given item is good or bad for us. In the 80s, we were urged to eat a lot of grain and legumes (“It’s a perfect protein!") and to avoid meat; now paleo proponents argue that a healthy diet is just the opposite. Chocolate was once a “bad thing," and now it’s good again. In a few years, will we discover its faults, one more time? But you know as well as I do that chocolate is good for us. After all, it tastes great. That’s enough, right?